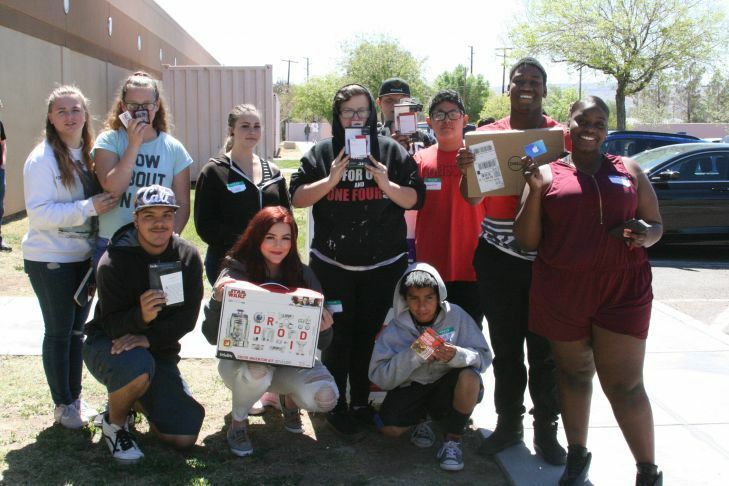 Eleven Trona High School Students participated in Bite of Reality sponsored by Desert Valley Federal Credit Union in Ridgecrest, Seven students won door prizes. Michael Taylor won a Dell laptop, Chris Staggs won a Kindle, Emma Smith won a Star Wars Droid, and the other students won gift cards, phone chargers. Fun, Safe, and Interactive Bite of Reality is a hands-on three hour activity using an app based simulation that appeals to teens while giving them a taste of real-world financial realities. Teens are given a fictional occupation, salary, spouse and family, student loan debt, credit card debt, and medical insurance payments. The teens then walk around to various table-top stations to “purchase” housing, transportation, food, clothing, household necessities, day care, and other needs. Fortunately, the game also includes a “credit union” to help with their financial needs.